You need a really sunny spot, at least six hours a day, maybe one of those greenhouse windows, southern exposure if possible, or a grow light. Be sure your soil isn't too rich - herbs like poor soil. Pots will need good drainage, and remember to turn them regularly. I have a really dark, small kitchen, so I was looking at this: http://www.amazon.com/AeroGarden-2101-00B-Classic-Garden-Gourmet/dp/B000FI4O90/ref=sr_1_5?ie=UTF8&qid=1348240935&sr=8-5&keywords=indoor+herb+garden , but $150 was a bit too steep for me. Good luck and happy snipping! be careful as you might get bugs! I have a large 'greenhouse' 7 ft x 6 ft x 3 ft and used to bring in plants to over winter. the only herb the bugs didnt like was the rosemary. I've read decent write-ups about the aerogarden - not so much about the light, but about the hydro part... it's a good intro to hydroponics... but yes, the light isn't beefy enough... I use a "daylight spectrum" CFL 24/7 when growing starts - up until the first couple of weeks of growth... leafy plants love it. Lettuce and other herbs will actually grow quite well (and a lot faster) when under the lights 24 hours per day. Can't do it for flowering plants, and some plants after several weeks get a little shocked... but things like lettuce, basil and other quickly harvested plants do great. Thought this post would be of interest for the new herb garden. Not herbs. Look into dwarf citrus fruits. I grow in five-gallon tubs Meyer lemon, yuzu orange, and one more which I don't remember the name off hand. Wonderful for cooking. This popped up on Facebook and I saved it because I am definitely going to try it. I have LIMITED space for plant pots but plenty of hanging space at the top of some big windows that get plenty of winter sun. How much trouble are they in terms of care and attention? Where I live there is no way I could grow citrus outside, but an indoor-outdoor dwarf in a wheeled pot should be doable. Got any photos of yours handy? ETA: Regarding herbs, if you're a newbie gardener I totally recommend trying to find a good gardening store/nursery in your area so you can get good advice and hopefully also really nicely started plants. I've had really mixed results from big box store plants and starting from seed. At the risk of highjacking this thread, I too would like to know more about dcarch's success with dwarf citrus. My dwarf satsuma produced fruit that never had any flavor. My Meyer lemon, admittedly not a dwarf but grown from a seed from my parents' ranch, never produced fruit at all. It became rootbound despite repeated repotting and root trimming, but that may have been this amateur's mishandling. One or both suffered from whiteflies and I never could get them eradicated. Having said all that, I'll also say that the blossoms from both were heavenly. Back to the indoor herb gardening: Andie, thanks for that indoor hanging herb garden link - you're right, it IS brilliant. I'll have to give that a go next spring. My rosemary survives the low-light winter, but the annuals - basil, oregano, parley - take waaaay too long to get going around here. This is what I get for growing up in a Mediterranean climate and moving to the frozen north.
" ------My Meyer lemon, admittedly not a dwarf but grown from a seed from my parents' ranch, never produced fruit at all. -----"
OMG! I think my little Meyer lemon tree may soon die! It is blossoming with tiny lemons, It must have at least 100 tiny lemons on the branches !!! The branches are going to collapse if the lemons get bigger. I will have pictures in another day. You cannot grow Meyer lemon from seeds. Throw it out and buy one from a nursery. BTW, this is not off topic. Citrus leaves are used as herbs. I grew up in California you just need to thin the lemons to the amount the branch will hold. I'd love to have these here in NE on my sunny window in the future. Anyone have information about curling chilies? We have two smallish chili trees, and the chilies on one are mostly curled into tight, flat spirals. They taste the same as the normal chilies, and actually look kind of cool, but I was wondering what was going on. Is this just some sort of fairly common mutation? Thanks PanCan! 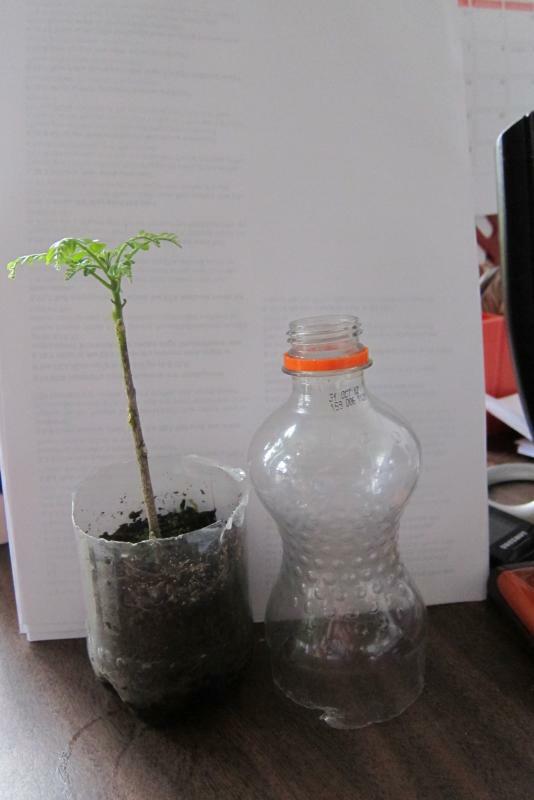 I was wondering about a mutation, because both plants come from the seeds of the same single chili fruit, and I've rotated the 'curly' tree several times, as well as switched the positions of the two plants, to see whether it affected the curling; so far, it hasn't. Taste fine, anyway. I actually prefer the curly ones for pickled chilies - they're so much more decorative! I live in an area that is designated as hardiness zone 8, and i dont use any special lights, extra heating, hydroponics, whatever, just plants in plastic pots that live with me in my living room/office. 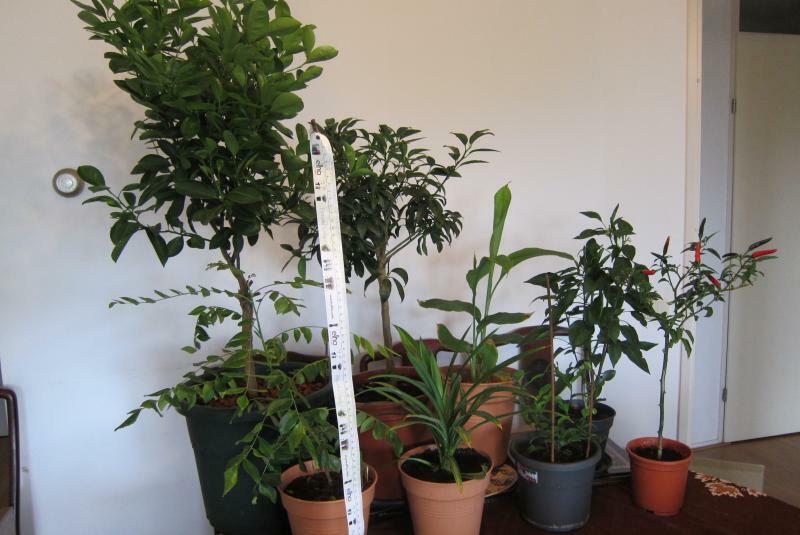 Below is a lineup of some of my plants; the tape measure is in centimeters (as seen on the right side of the tape). In the front row, starting from the left is one of my curry leaf plants (Murraya koenigii); next to it is a pandan plant (Pandanus amaryllifolius) ; the unfortunately named kaffir lime (Citrus hystrix); and a chilli plant grown from the seed of a packet of store bought dried Sichuan chillies. In the back row is a calamondin/calamansi (Citrofortunella microcarpa),; a kamquat (Fortunella magarita); turmeric grown from store bought rhizomes; and another of the same Sichuan chilli plant. I do have a Meyer lemon but forgot to put it into the lineup for the photo. You do not see any flowers or fruits on my citrus plants and that is because in the growing season, i remove them to encourage vegetative growth. At this time of the year, when the flower buds appear i let them grow to bloom around Xmas and New Years, and the scent permeates everywhere. Who needs air fresheners? For those interested in growing their own curry leaf plant using store bought curry leafs (with leafs still attached to the stem), here is my setup. The top goes over the bottom and it becomes a customised/personalised greenhouse. It takes about 3 months to get to this stage and success rate is about 20 to 30 % for me.